When I first started to design my PDM, I thought I would adapt a box from a production vehicle. Doing a little research online lead me to a 7-relay PDM from early 90's Jeep Cherokee models. The issue here is that this box only has 7 relay sockets and I needed 9 relays. But this gave me the idea to look at other PDM boxes from trucks, vans and SUVS. While wandering around my local Pick n Pull yard, I discovered a really cool modular box that can be found in 1997-2000 Ford Ranger and Explorer models. I pulled two of these boxes, one from a 1998 Ranger and another from a 2000 Explorer as well as some extra dual-relay modules from a 1995 Mazda B-series. I set to work swapping modules and wires around and quickly discovered some problems. First, 20 years of heat and weathering caused the plastic Ford used to become brittle and many of the plastic retaining tabs used to hold the terminals in would crack and break. Second, Ford used a proprietary style of crimp terminal for these boxes, referred to as the Ford Box or Ford Block style crimp and these have long been discontinued. So I can't buy more of these terminals to do my own wiring. After some frustration I reluctantly abandoned these boxes, but at least my monetary investment wasn't very large (~$20 per box). After this setback I did more research and discovered a company and product called "Dill Blox" (www.dillblox.com). This is a completely modular system for building fuse/relay and PDM setups and uses commonly available crimp terminals, often Metri-Packs. I got myself setup with some 3D models of various Dill Blox modules and after several revisions came up with this layout. I setup this layout so there is minimal wasted space. 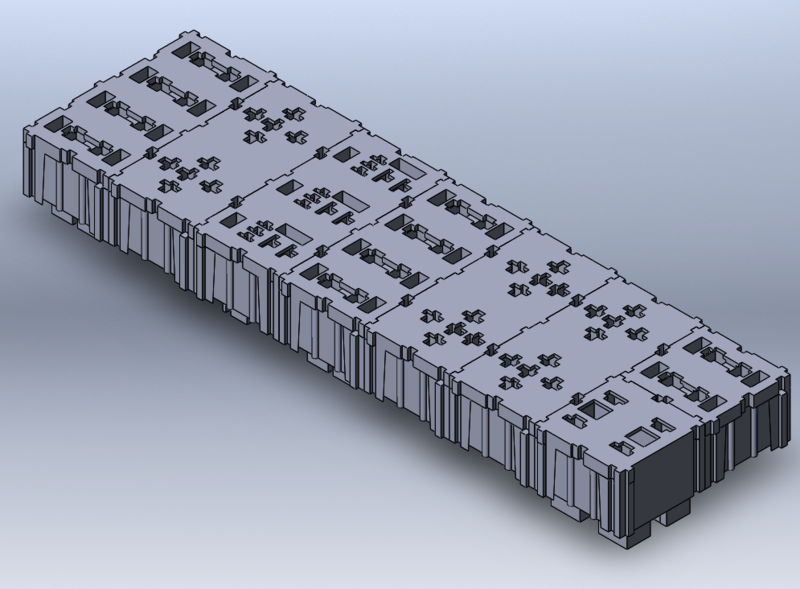 In fact when I finished populating this the only unused position is 1 of the Maxi fuse slots. This setup accommodates 9 relays (6 ISO Mini, 3 ISO Micro), 10 ATO/ATC fuses and 2 Maxi fuses. And being Dill Blox, if I ever need to expand on this or re-configure it, I can do so simply by adding more modules. 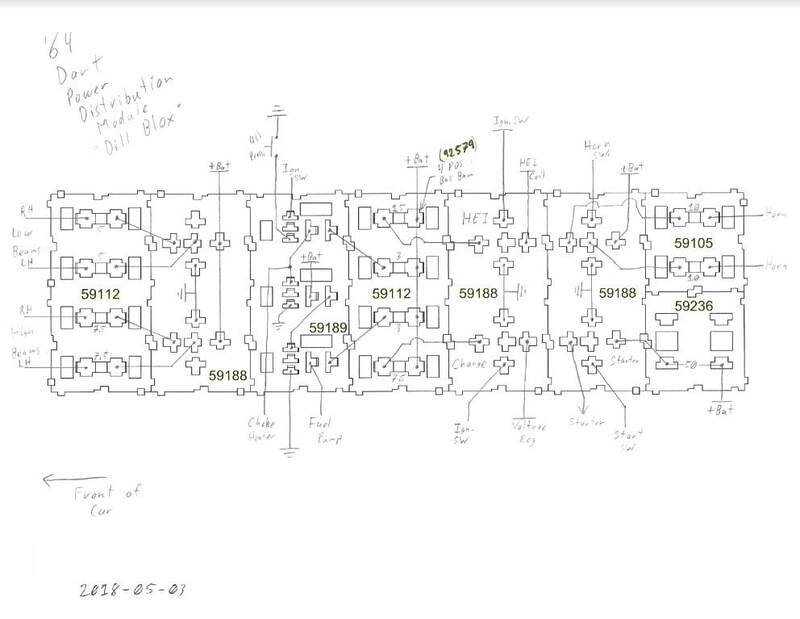 Combining the layout of this 3D model with an overlay of wire runs from my sectional wiring diagrams, I created this drawing that can be used for wiring layout work.